Imagine competing with this guy for an spot in an apartment. We all know how awkward trying to find a roommate can be once you’ve put your room on Craigslist. The poorly written emails, the hope that the person you’ve asked to come meet you isn’t a complete psychopath, the gaps in conversation. Running Late host Scott Rogowsky decided to get ahead of the awkwardness the only way he knew how: by turning his apartment into a talk show set and interviewing potential new roommates he found on Craigslist as if they were guests on his show. It’s pretty inspired stuff, though if the above video is to be believed, we’re definitely impressed by/concerned with Rogowsky’s masturbation habits. 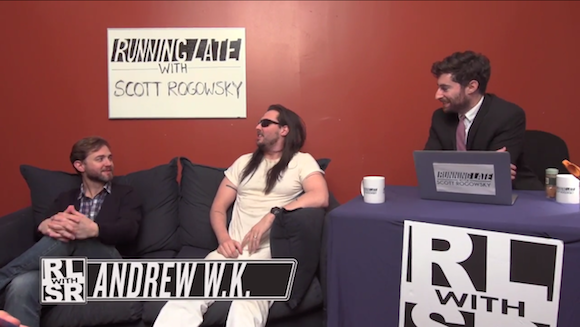 While it must already feel strange to walk into a roommate interview and find yourself on a talk show instead, the weirdness is definitely amped up when the likes of Gilbert Gottfried and Andrew WK just stop in to say hi. Each interview was given its own YouTube video, which you can watch on this playlist here. Why not stop to watch them? Does your boss actually expect you to work the day after Memorial Day? If you liked that, you can see more Running Late this Wednesday at Littlefield for just eight bucks, at a show that will feature Hot 97’s Peter Rosenberg and Steve motherfucking Buscemi. You might remember that Buscemi now has a talk show of his own, so maybe Rogowsky can give him some tips on hosting.